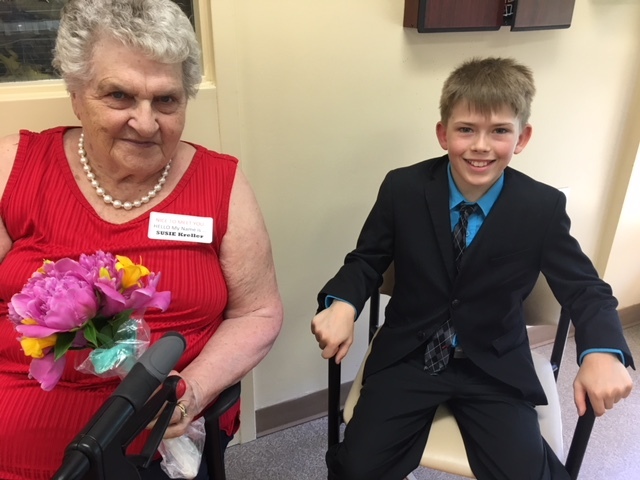 In March 2018, the home was approached by the school next door to see if they were interested in a Grandpal program with the Grade 3-4 class. The plan was to write letters back and forth and then meet later on in the school year. The home eagerly agreed as they have seen the benefits of intergenerational programs and had a group of residents who were very interested in this activity. The first step was a survey that the residents had to complete so they could then be matched up with a child who had similar interests and backgrounds. The children and teachers selected a pen pal from these completed surveys and the writing began. Many of the residents needed help writing the actual letter so the home involved program staff, volunteers, and also family members. During this process some family members learned things about their parents that they never knew, as details were shared though the letter writing. It didn’t take long to form a connection between the writers both the students and the residents eagerly looked forward to each letter. The group had a planned meeting in June, but some of the children just could not wait to meet their new friends. One weekend, a few children showed up on bikes and asked politely if they could please meet with their grandpals as they did not want to wait until June! The letters then continued, each one developing the bonds that were forming. In late June, the class came over, many dressed in their finest attire, with a few of the boys even wearing suits to officially meet their new friends. The class entered the room with great anticipation, singing “Today we’re going to try and change the world.” After another song - “What a wonderful world” - each of the children and grandpals were introduced. The hugs and conversation began and some even shared little gifts with one another. Watching and listening to the interactions was a very moving experience for the staff of the both the home and the school. One match involved a young girl who had been writing to a man who was visually impaired from birth. He is a musical gentleman who plays the piano by ear and is quite an inspiration. His pen pal nicknamed him “Her Music Man,” and she has been learning braille in hopes of being able to write to him in braille next year. Rockwood hopes to continue this activity next year; one resident said this is the only letter he ever receives. The home shares a yard with the school, and now when the seniors watch the children outside for recess, there is even a deeper connection with the relationships that have been formed. In photos: Rockwood residents and their pen pals pose together.